The KickstArt 2018 year kicks off with the delicious award-winning new hit comedy: The Play that Goes Wrong which will be staged at the Elizabeth Sneddon Theatre just after Easter from April 6 to 29, 2018. 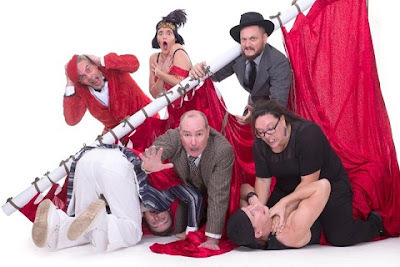 Described as Fawlty Towers meets Noises Off, The Play that Goes Wrong is a fairly new production, premiering in London in 2012, which went onto win every major award on the London stage, including the 2014 WhatsOnStage Winner for Best New Comedy; 2015 BroadwayWorld UK winner for Best New Play; 2015 Olivier Award for Best Comedy; 2017 Broadway.Com winner Favourite New Play and 2017 BroadwayWorld (global) winner for Best New Play. Many TV viewers will remember the delicious excerpt they did for the 2015 Royal Variety Concert (which is well worth viewing on YouTube). Even before the play starts, the audience see the technical team doing last-minute adjustments to the set, including trying to mend a broken mantelpiece and to find a misplaced dog... The inexperienced, accident-prone luckless thespians battle against the odds to make it to their final curtain call with the set still standing, with hilarious consequences! The Play that Goes Wrong stars James Cuningham, Liesl Coppin, Bryan Hiles, Michael Gritten, Daisy Spencer, Mthokozisi Zulu, Iain Ewok Robinson and Adam Dorè. It is directed by Steven Stead and designed by Greg King. Schools performances R130 throughout. For schools’ performances, charity fundraisers or block bookings of 50 or more, contact KickstArt Theatre via email: kickstart@letni.co.za. Also, note the Early Bird Special Offer on ALL shows: Buy 8 tickets and get 2 free! This offer is available through Computicket up to the first performance of each production.